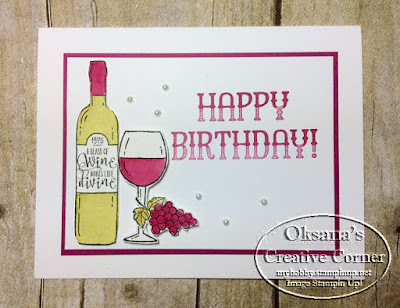 Today I want to share a card we made at my Crafting Happy Hour class at local wine shop. 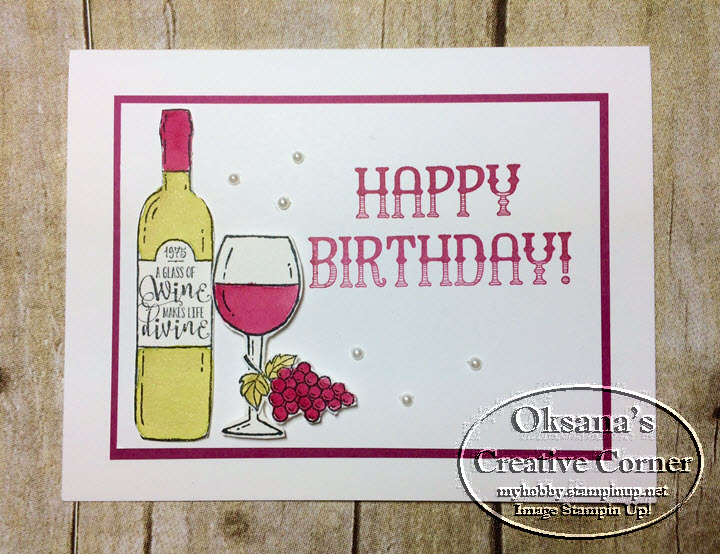 This card uses Half Full stamp set - perfect set for wine lovers! Of course - when I saw that set in the catalog, it was my #1 to have. The card is very simple and is great to create in multiples. Create card front from thick Whisper White CS by scoring at 4 ¼ ”. Stamp wine bottle, glass and part of the tag with grape on scrap watercolor paper in archival black ink. Using Aqua painter to paint stamped images with old olive ink and berry burst. Just squeeze the lid of the ink pads to transfer the ink to the lid and use it as a pallet. Let the images dry then cut them with the paper snips. Set aside. Stamp “Happy Birthday” image in top right side of the whisper with piece. Mount into berry burst mat. Then adhere to the card base with snail. Adhere bottle with snail and wine glass and grape with dimensionals. Embellish with pearls. Happy Stamping. Online Extravaganza starts Monday. Check the list of all items that will be on sale HERE. Sale starts November 20th in my online store.